Can you believe we’re half way through the year already!? That’s just crazy! However it also means that the Summer sales are starting instore and online, which is excellent if you’ve been poised ready to pounce on buying those holiday essentials at reduced price. 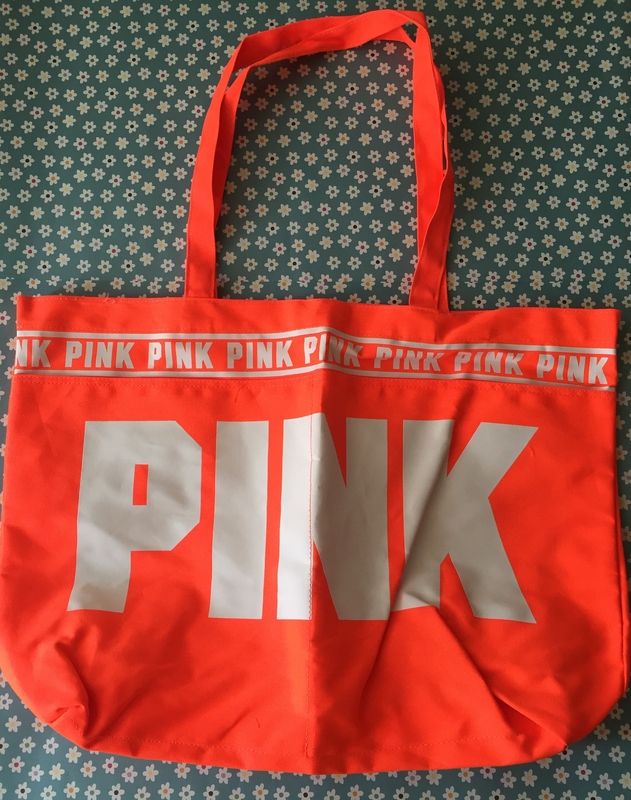 I love the Victoria’s Secret sales, however more for the Pink clothing range. The quality of the T Shirts and vests is brilliant. They’re long lasting, easy to wash and they maintain their shape no matter how many times you’ve worn and washed them. I picked up quite a few things instore and online for my Summer vacation. The downside of the website is that they still don’t have a UK version, so shipping internationally also means customs tax on top of shipping costs. I love the design on the back. It’s very me! 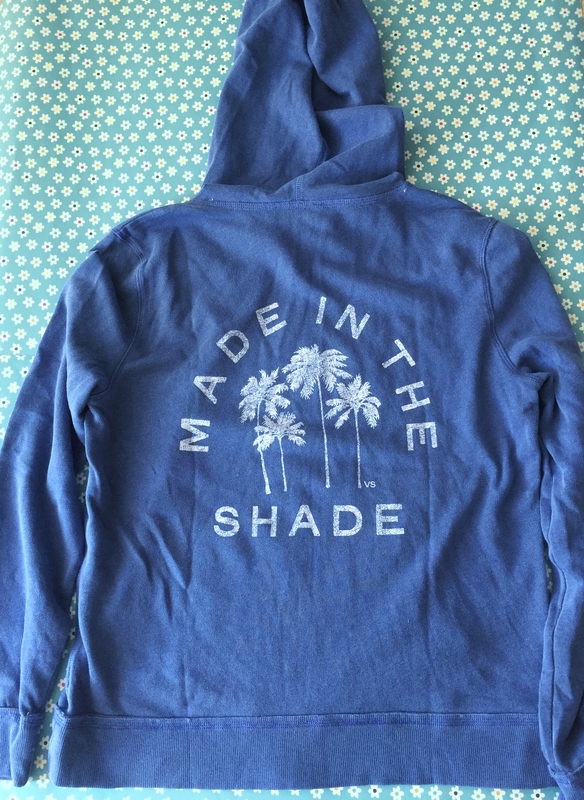 This is just a blue cotton zip up hoodie with a white transfer on the back. Anything with a palm tree print is a winner in my eyes, as it screams vacation. I ordered this in a medium however I’m wishing I got a small as it’s slightly larger than I wanted. However I’ll be wearing this to travel in so it’s not an issue. This is one thing that I purchased online so it would cost me more to return it back to the US. I’ve had my eye on this for a while as I like the glitzy vibe with the pretty floral print. 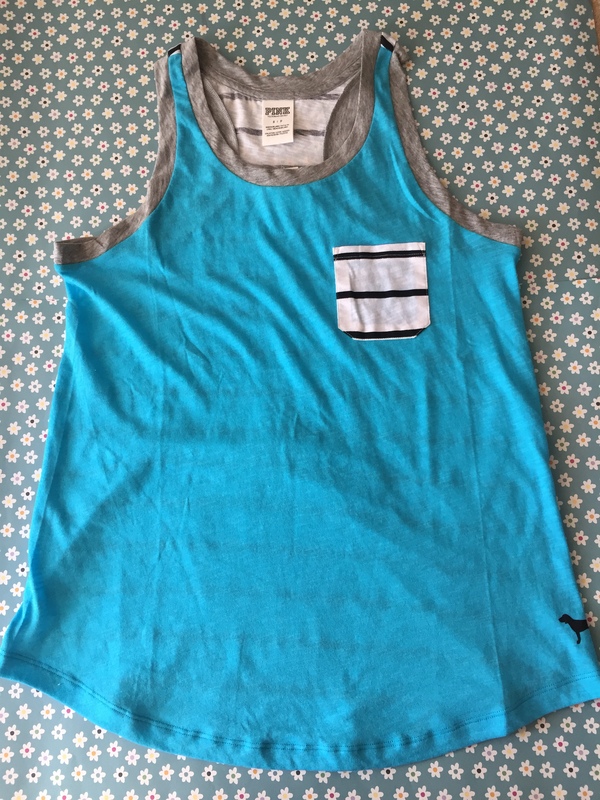 This is a racer back vest which is very low cut under the arms. It will be the perfect beach/pool cover up as your bikini will be visible at the sides. Nice and cool, perfect for the hot weather. This is SO bright! I didn’t expect it to be this bright however it is really big and will hold lots of essentials for going to the beach eg towels and sun lotion. If it reflects onto my pale skin, it might make me look like I have a bit of a tan haha, added bonus! All the Tees are a mix of cotton and polyester. They’re light, stretchy and not overly see through. 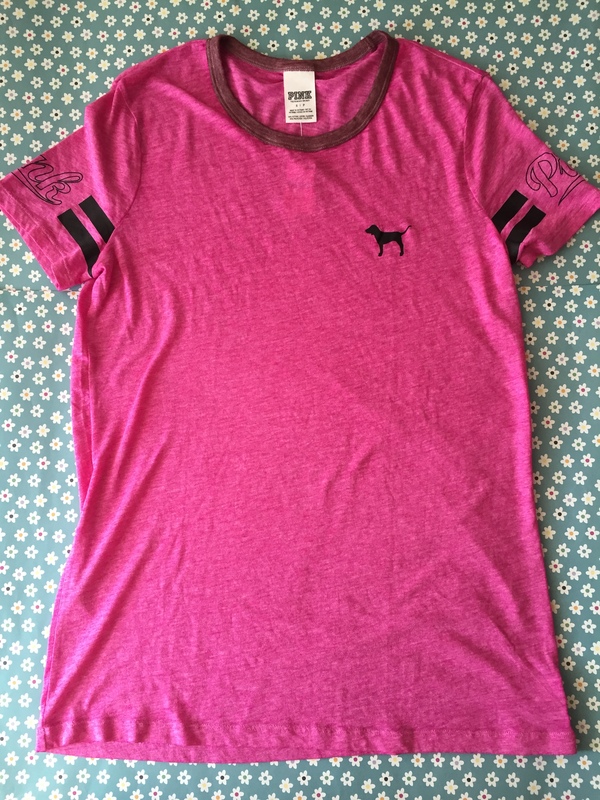 This one just has Pink written on the sleeves and of course the cute dog logo. I like the fuscia teamed up with the red wine detailing around the neck. I love this! Last year the theme of the tees were plain with a patterned pocket. 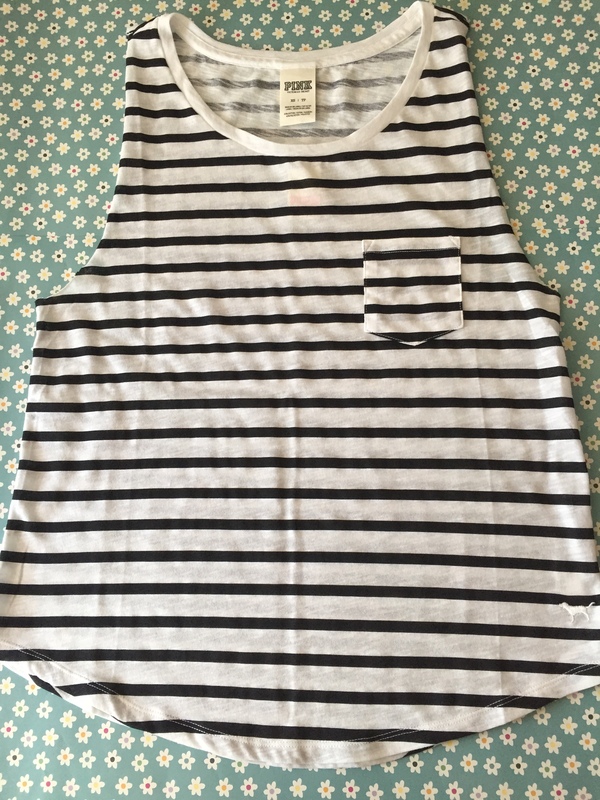 This vest has the same vibe however the back is striped matching the pocket. This will look super cute paired up with denim jeans and sandals. Again the material is the same as the tees, so it’s really light and great for the Summer months. No one can have a haul without featuring a striped top of some sort right!? 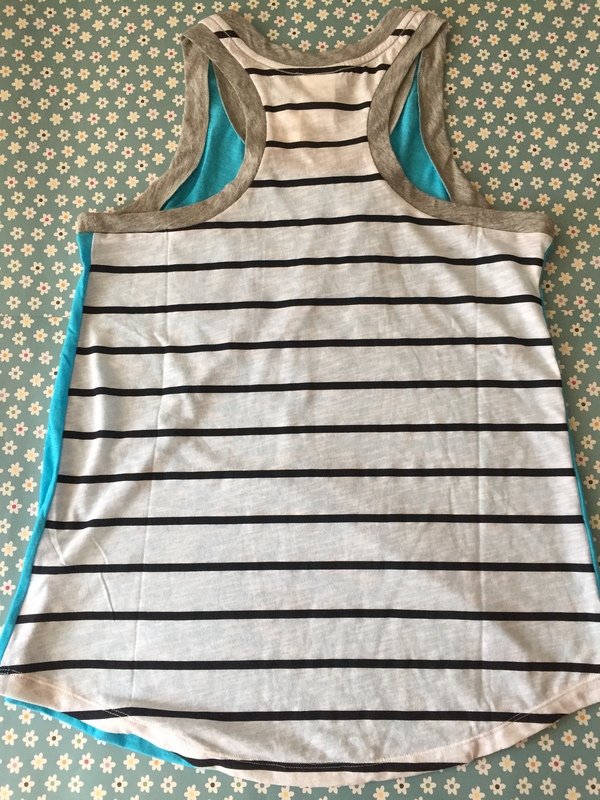 We all seem to love stripes and this is just a classic vest top with a pocket on the front and is black and white striped. 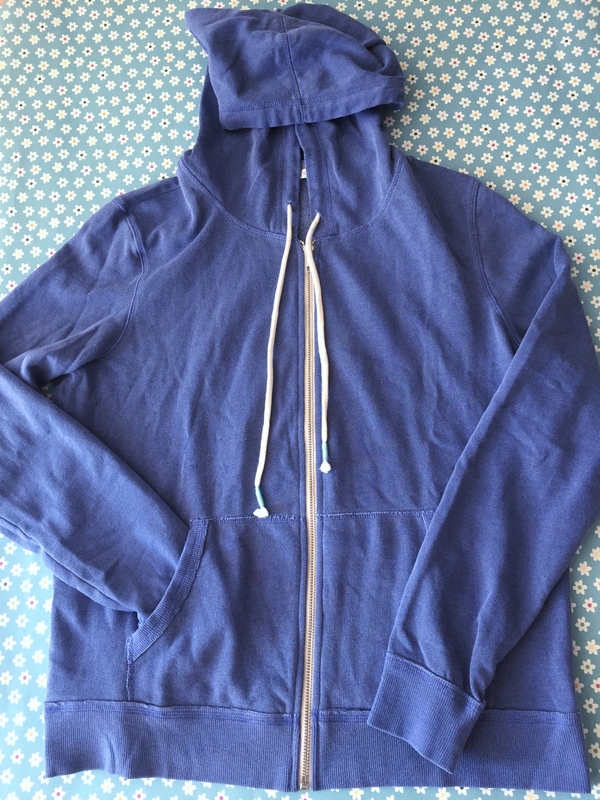 This looks amazing on and it’s very flattering… which of course is key! This is a classic piece which will pretty much go with anything. I might have to return it though as I picked up and extra small. 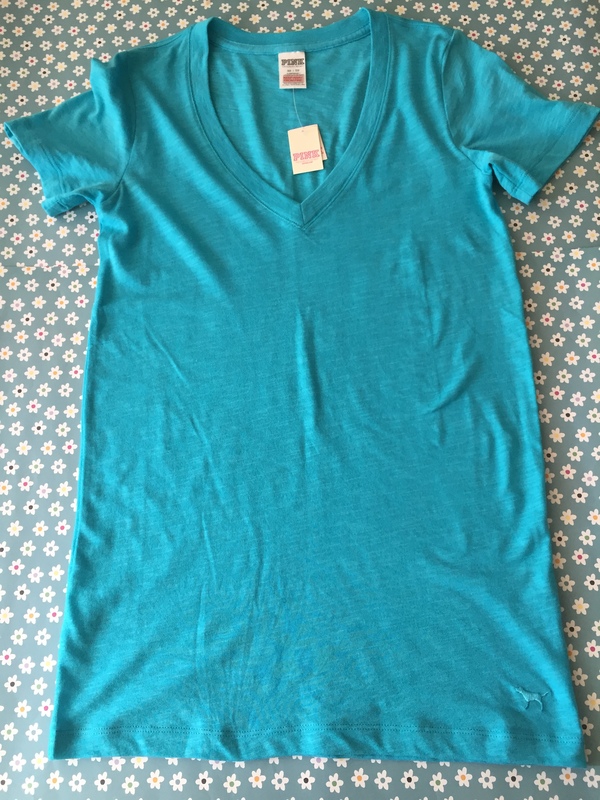 The material is slightly thicker on this than the other tees which makes it rather tight fitting. It would be ok for here however for warm weather I like to have loose fitting items. It is a very pretty aqua colour though. If you’ve ever been to a Victoria’s Secret sale then you’ll know that at the front of the store there are loads of baskets filled with knickers of all varieties, styles and designs. Everything is reduced to £3. I managed to pick up these as I thought they were pretty cute. Saving the best until last… I absolutely adore this!! It’s so cute and so me (and it’s striped!). It’s basically a larger sized wallet from the pink studded one I posted a while back. It would be great as a make up bag, an evening clutch or for storing any valuables when you’re at the beach. Me, well I’m actually going to use this as a travel wallet and keep my passport, money and tickets in it. I seem to lose so much in my Louis Vuitton Speedy bag so this will keep everything nicely organised together. So let me know what you all think of this haul. Have you been to Victoria’s Secret or Pink recently and got any bargains in the sale? Let me know, I’d love to hear what gems you all found. 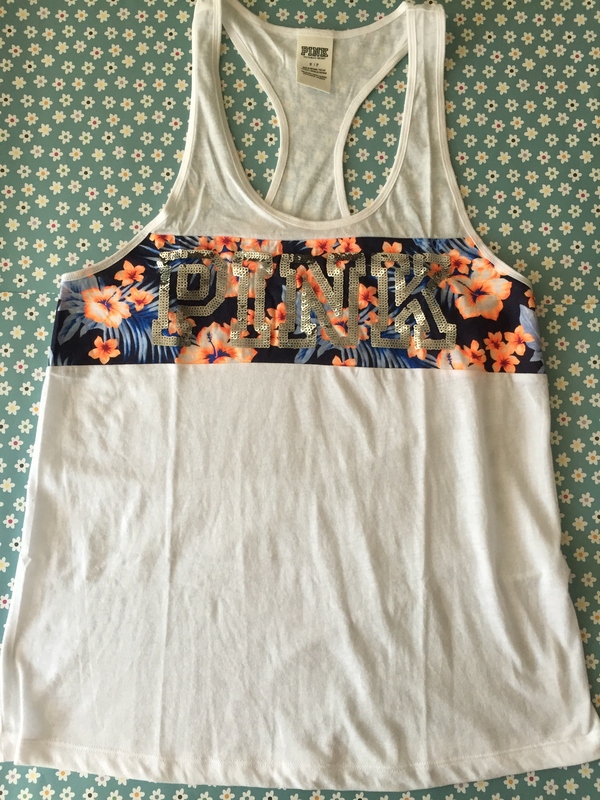 Love love loveee the PINK top with tropical trees on! Nice haul!! 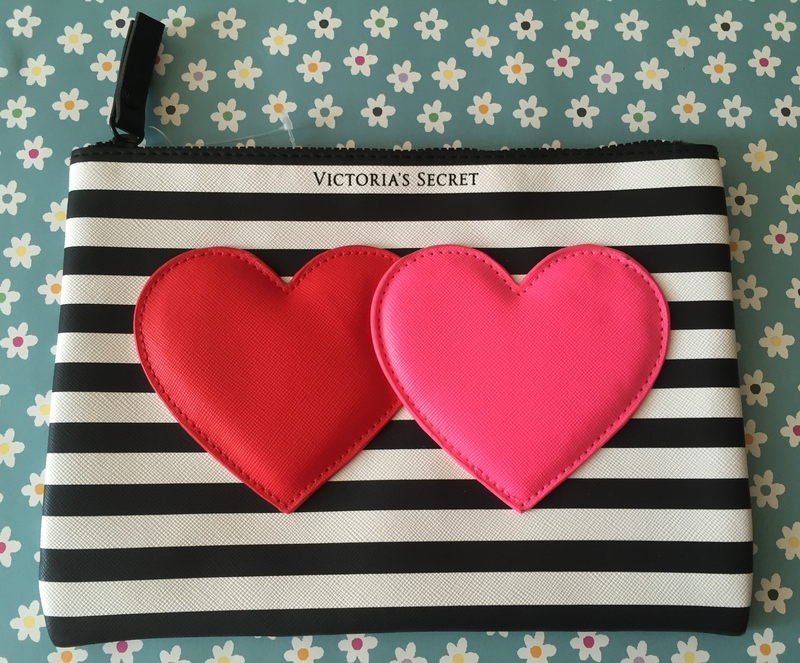 I’m especially loving the heart wallet; so pretty. Amaazing pieces you snagged during your haul; my personal favorite is the wallet …. it’s just wayy too cute to define into words. that pink beach bag is to die for..